Reaching business owners and professionals online can be a challenge because the target audience is usually smaller than in generic, consumer marketing efforts. This is why many business-to-business (B2B) marketers and recruiters use LinkedIn to find business owners, purchasing managers or potential workers. Even if using LinkedIn helps to narrow the search, there are still millions of profiles to sift through. 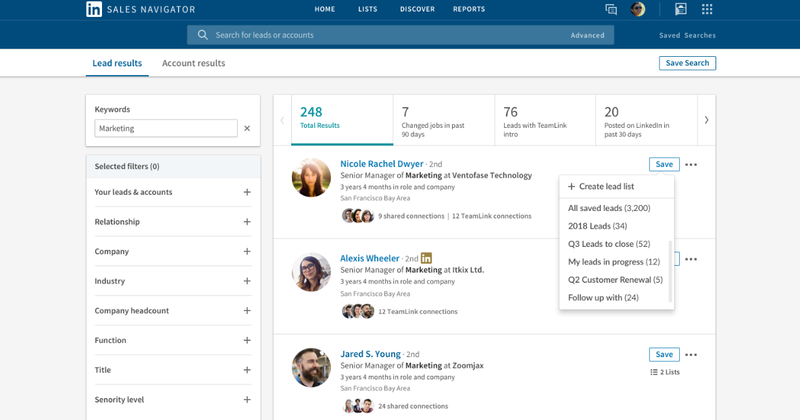 To make it easier for businesses to generate leads from LinkedIn, the business social media platform has made some significant updates to its Sales Navigator feature. To make it easier for users to find their target audience on LinkedIn, the platform is introducing new updates to custom lists. Now, Sales Navigator users can create custom lists with an unlimited number of customized lists for saved leads and accounts. Additionally, the lists can now be accessed from the mobile version on the Sales Navigator, which means marketers can check their leads no matter where they are. The new updates to Sales Navigator will also make it faster for users to sift through through their entries. Custom lists can now be filtered by details such as “people who have changed jobs in the last 90 days,” or “people who have posted on LinkedIn in the past 30 days,” or “companies who have had senor leaderships changes in past three months.” Users will also be able to add specific notes to the entries that can be helpful reminders later. Someone connected to a saved account views the user’s profile. A saved account raises funding. A saved lead has engages with a LinkedIn post from the user’s company page..
As was noted in the changes to the alerts and custom lists, the mobile version of Sales Navigator is receiving some changes. Besides the changes mentioned above, LinkedIn is making all of the search features that are available on desktop available for the mobile version. These changes are perfect for members of a sales team that are on the go, as they will now have greater access to their Sales Navigator tools, such as advanced search filters, the search history and the searches that have been saved for the account across various devices. There are also some updates that will help sales team coordinate better. LinkedIn is including a new “Reports to” field on the lead page to track direct reports. LinkedIn is also giving Sales Navigator Admins more control for assigning users to managing groups. LinkedIn has also integrated Sales Navigator into the Account Center as a LinkedIn platform, which means any Admin who may be managing other LinkedIn properties for their company (e.g. LinkedIn Learning) will be able to manage Sales Navigator from the same account. For more recent changes that will affect business owners, read this article about changes Google recently made to their platform.